WARNING: I am about to write about a hot topic to authors and aspiring writers all over the globe. Don’t hurt me! I told myself when I started the redesign of my site that I’d do my best to avoid writing-advice-type blog posts. This isn’t one of those, but I realize some people might read it that way. I hope you’ll see this for what it is: just me working through some thoughts and reflections about my own process. You see, there’s a ton of writing advice out there. Too much, probably. It doesn’t matter if you’re looking to find an agent and pursue traditional publishing or if you’re going to self-publish. There’s so much being said about what you must do prior to becoming a published author that there’s no possible way to wade through it all and still find time to write. My kids are probably wondering what pop-culture reference I'm using here. Click the image to find out! One of the big pieces of advice I see a lot is the idea that to be a successful author, one first has to build a platform. Now, there’s probably some wisdom to this, but it is by no means absolute. Looking back through my writing books and periodicals, I can tell you that it seems to be more of a common thing in recent years, and more commonly associated with advice on how to get an agent. But I’ve seen it on both sides. What is this platform business I speak of? A writer’s platform is basically their core audience. Followers of this blog would contribute to my platform, as would those who like my author Facebook page and follow me on Twitter. Naturally, having a strong, healthy platform would be great for any author. If your fans follow you on multiple social media sites and read your blog posts, you’ve got a very receptive audience. It’s obvious why this would be a huge plus for an agent who is considering shopping your work around to different editors. An author who comes to the table with their own audience reduces the work the publisher would have to do in order to see a profit. But how does a writer start this process of building a platform? Does one need to practically achieve professional bloggerdom before they can approach an agent or hit publish on their self-published book? Must they really be some kind of social media maven? I will admit, for a long time I bought into this. Years. And I think buying into this advice stunted my writing. Time spent trying to network and come up with clever posts didn’t help me become a better novel writer. Focusing on presence and platform only served to distract me from my ultimate goal. I wanted to write short stories and novels, but I ended up wasting my time trying to attract people to my old blog. I spent hours reading other people’s blog posts and commenting in the hope that they might do the same. At best, I attracted other writers, not readers. This isn’t bad in and of itself, so long as those writers are also readers. I’ve learned that this isn’t always the case. Some writers actually refuse to read books written by other people! What is this madness? To answer this question, I’ll have to give it some context. I’ve been interacting with one writer in particular on social media for a while now. I’ve watched this writer, who lives on the other side of the world, post witty tweets and blog posts. I’ve seen the number of responses they get, and I would be lying if I said I didn’t get a little envious. They really seemed to have it all together. Under the surface, though, I think they are struggling. I look at my own journey and I see a lot of similarities. Mountains are being moved in the name of platform, but the novel still goes unfinished. While I think I’m better rooted in my overall strategy and writing plans these days, I can’t say I don’t ever fall back into old habits and beliefs from time to time. And, yes, this is especially true when you take a look at other writers you’ve networked with and see how active some of them are on social media, how many replies they garner whenever they post something, or how many comments their blog posts get. I was feeling this way around the time I wrote the post about two paths, but I realized something that should have been a little more obvious. What we see isn’t always the whole story. There will always be those rare few who seem to be able to do it all. Most of us don’t fall into that category, and sometimes a platform does come at a cost of actual writing. Just as with other distractions, I think sometimes we might even use the notion of platform building as a way to escape working on our own stories. There is a lot of fear associated with writing at times. We read what we’ve written and feel self-conscious about our work. We worry that we don’t have what it takes to write a good story. Maybe our characters feel flat and we just don’t know how to reconnect with them. We stare and the blank screen and wait for the words, but they never come. There are many reasons to be afraid, and I think that’s just part of being a Creative. When you write a story, you’re putting yourself “out there” for other people to examine and criticize. Some people get stuck on platform building while others might eternally rewrite or abandon project after project whenever a new idea comes to them. Oh, no. 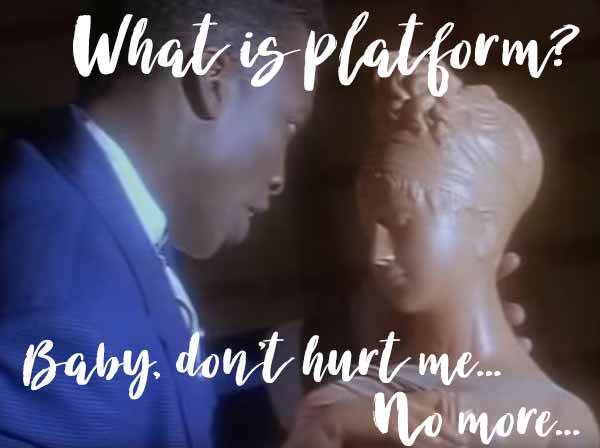 I’d never say platform is worthless. On the contrary! But I do believe there is a time and a place for everything. That means my Facebook likes and Twitter follows aren’t going to skyrocket. It means my first few book releases are probably going to be slow burns. I have to be okay with that, and it really isn’t an awful expectation to have. I think if I focus on the writing and creating the best story I possibly can, the slow burn will gradually turn into more of a raging fire. My platform will build over time, naturally. To me, this is the right answer because I just can’t see what good a platform is if you never publish anything. Some will disagree. I’m okay with that. This is my way, and that should be okay too. Great, thoughtful post. As you say, it’s important to remember that the right answer is the right answer for *you*, not the right answer generically. Building a platform can be a big distraction from actually writing, and each writer needs to find his or her ideal balance between the two. It’s easy to get too caught up in platform-building because the rewards are immediate. Someone replies to your tweet or comments on your post and you get a buzz. A novel, on the other hand, can go a long time living solely in your head and on your laptop, with no feedback or warm fuzzies anywhere. It takes discipline to keep going at what some days feels like a thankless job when you have such a rewarding one right at hand. Another great point you made is that even people who seem like they’ve got it all together probably don’t. Hey, we all censor ourselves somewhat online or no one would want to talk to us. :). Excellent points, A.S. Thank you for commenting! This post was a whole lot of me thinking out loud and trying to nail down my own strategy. I think we all struggle with comparison-itis from time to time and I think you hit it right on the head. It’s probably safe to assume that we aren’t seeing the whole picture when we compare ourselves to other people. Conversely, even if everything is exactly as it seems, what works for one person won’t always work for everyone else. It’s really about finding ourselves as artists and discovering our own path. The journey is a beautiful thing.